to all the Sarah supporters here in California (and out-of-states as well of course), malapit na naman nating makita si Sarah....for those of you who have not bought their tickets yet, there's still time to buy..just login into the Orpheum Theater, Los Angeles and you can buy your tickets directly from there....or call tito Al directly for more information. Hello fellow popsters... Sarah will be arriving soon for her US Tour Concerts (see below for locations/dates). Let's all show our support to our Asia's Popstar Princess. Ready na ba lahat ang mga Popsters, "Ash" Teams, and all Sarah supporters...the anxiety level will get higher each day from here on forward. Let's all show our support to our Asia's Popstar Princess Sarah. Mga ka-group ko are coming from Vancouver, New York, Iowa, Northern California, and of course Southern California....wow joint forces ang Canada and USA looking forward to bond with "old" friends and meet "new" ones as well....the more the merrier talaga! nakaka-miss talaga si Sarah....Sunday marathon sa mga SGL Statement Songs />, called friends to discuss her upcoming US concert tours...what a Sunday?? Again , if you need help in getting tickets for the June 2nd, Los Angeles venue please let me know....you may call me or leave a message at (760) 773-1344..
See you all at the concert!! hope everybody could come and join us too....hope to see all the Sarah supporters out there lalo na dito sa Southern California...hope tosee/meet you in either the San Diego or the LAos Angeles venue. There's still time to buy your tickets. for the LA venue, you may call me at (760) 773-1344 if you need assistance in buying your tickets. Edited by ILY_SG, 20 May 2013 - 09:06 AM. got too many deadlines here at work, otherwise I'd be coming to watch in SF as well or even Phoenix.....it's about 8-9 hours driving distance either venue...that is excluding traffic, etc....but that wouldn't matter kung kaya lang ng schedule eh. will anxiously wait for your kwentos and pix...enjoy! 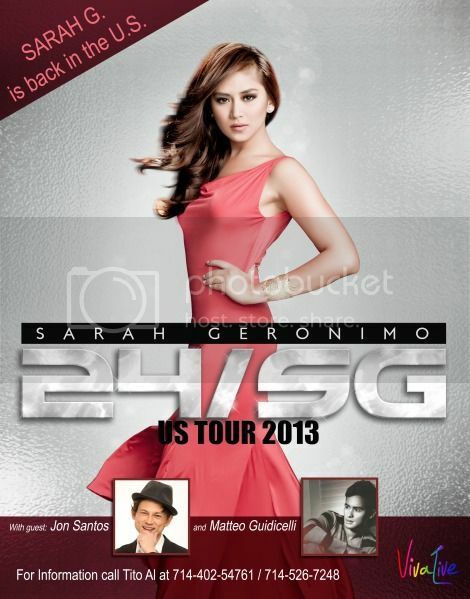 Have a safe trip Sarah and the whole 24/SG US Tour entourage/group.....see you soon! Popsters International malapit na malapit na talaga and Sarah will be in the land of the US of A. Enjoy the concert and dont forget to share pics vids and all highlights of her US tour. Von Voyage Sarah and keep safe always. Welcome to the USA Sarah! Thank God you all arrived safely. Have a great concert this weekend Sarah and we'll see you when you get to SoCal. I am sure everyone who's watching the SFO venue are enjoying their time....one down...3 more to go...sa mga wala pang tickets, you still have time to buy especially for the San Diego and Los Angeles venues. see you all at the concert or at the M&G or both.